One or two days after I read this article, I received my own surprise thank-you note. 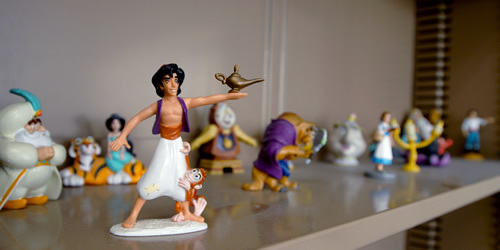 My mother is cleaning out all her kids’ accumulated junk (we’re 34 and 40, so it’s been in her house for a while) and she asked me what I wanted to do with my collection of glass Disney figurines (see http://calstate.fullerton.edu/news/Inside/2009/photos/disney-figures.jpg for the best picture I could find of what I mean). I wasn’t interested in keeping them and told her she could sell them or give them away. She had a coworker whose young daughter liked Disney and would be interested in them. “Fine,” I said, “it would be nice if someone who would appreciate them got them.” And I put the figurines and their future with this girl out of my mind. My own surprise thank-you card. What’s the best thank-you you’ve ever received, card or otherwise? I’ll choose one random commentator on Saturday to receive one copy of each of my books (The First Move and Reservations for Two). What a great thing for all three of you to do. Your mom for thinking of the idea, you for giving up something you no longer wanted and Kenadee for sending the note. It's definitely an AW moment. Once in a while I get thank you notes from my great nieces and nephews. It is always their own idea to send them. I like getting thank you hugs also. What a wonderful story. When we were dating, my husband used to hide surprise notes at my job. I would find them while I was working. I work with a very nice lady who says she knows you from a reader's group in Durham. Her name is Meg. I once hid a box of Enstroms Almond Toffee in my fridge for Christmas and didn't find it until well afterwards. How nice that you get thank-you notes from your great nieces and nephews! I've done similar things with treats or something I'm going to "save for a special occasion." 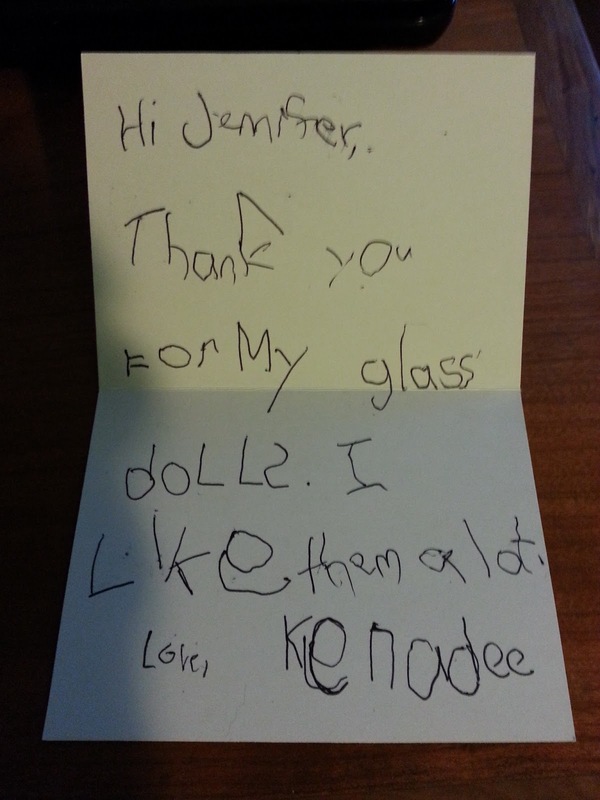 Awwww...That's the sweetest little note! Thank you notes... Surprises... Lovely post. I haven't received a real Thank you note in years. But I love phone call thank you's as you get an added treat of having a chat. I never thought of the benefit of the added chat for a phone thank you. Good point! I am fortunate to have received lots of thanks, "cards and otherwise" and all were special to me. I have received thank-you cards, emails, phone calls, baked goodies, flowers, indoor plants, perennials, items someone was going to donate to charity and thought I'd appreciate them instead, lots of hugs, and I'm sure other gifts of love. From my daughter, I have recently been blessed with tears along with those thanks/hugs, as she knew how lucky she was to have such a supportive family. Because I write poetry, many have blessed me with their own renditions of poetry too (although one 40+-year-old emailed me two Valentine poems he definitely wrote himself this year thanking me for being so nice to him, despite knowing I am happily married for 32 years; cringe). One of my favourite things to do for friends is bring them homemade desserts, fresh out of the oven, if possible. By bringing small quantities, nobody feels like they are over-indulging/pigging out, but instead enjoy their little treat. When we would visit my sister and her family 2000+ miles away for Christmas Break when our kids were young, I often spent the last evening going through their cupboards and writing on cereal boxes, for example, or leaving notes where they wind up the grandfather clock, or in between towels. I left dozens of them so that they enjoyed our closeness/bond long after we had left. I tried to gear my comments to the item, like, "Hope there isn't a 'cereal' killer in the neighbourhood! ", "Looks fishy to me", or "time to get to work". I've been punny most of my life, but my family bears the brunt of it. I knit baby booties for my friend to give to all the new bubs born to the Kindie parents. I've been doing this for years now. A while ago I received a note and a photograph. The booties I had made were worn to the baby's Christening. My booties had been blessed in every possible way. Thanks for the lovely surprise thank-you ideas, too! The baby booties is a wonderful story!